My very first encounters with sharks happened right here in the waters off New England. It was about twenty-five years ago that I met a shark scientist named Wes Pratt, who worked for the National Marine Fisheries laboratory, Apex Predator division in Narragansett, Rhode Island. Wes had built his own shark cage and was diving offshore with some of his colleagues, like Greg Skomal, who continues to work with sharks today and has recently done some cutting-edge research with several species. After pestering Wes for some time, I was invited to join the group and was absolutely thrilled. The sharks we most often saw were blue sharks. These were exhilarating days filled with anticipation as I steamed offshore and spent hours drifting in the chilly water, watching stunning indigo blue animals nosing through the slick. Occasionally we saw a basking shark and once saw a couple of dusky sharks, but mostly it was the beautiful blues. We always dreamed of seeing makos, as these animals had almost legendary status as one of the fastest and most powerful species of shark in the sea. Wes had a vanity license plate on his old Volvo that said “ISURUS” which is the scientific name for makos and even used to sign his hand-written letters to me "Clear Water & Mighty Makos, Wes." As we sailed offshore on every trip we inevitably would talk about how maybe this was the day. And each day Greg Skomal religiously predicted a four o'clock mako but as 4 p.m. rolled around, the elusive fish rarely materialized. In all the years I made these shark dives, I think I saw two makos and both stayed near the boat for only a few seconds. In the years since then my work has taken me around the globe photographing sharks in countries worldwide. I have longed to get back to my home waters, but being in the field on assignment nearly eight months each year left little time for shark diving in New England. A couple of years ago, I was contacted by an underwater videographer named Joe Romeiro from Rhode Island. I had seen Joe's shark films and they were beautiful. He had a true artist's eye and his films were respectful of animals and brought viewers into their world for an intimate view. Joe was doing a fair bit of shark diving locally and invited me to join him, but as usual, my schedule simply never permitted me to do so. But finally last week, the day after I made my last blog post ("Thinking About Sharks"), I went diving again for sharks in New England. Joe had told me he was having great luck with not only blue sharks but with makos. I was amazed to hear this given the few sightings I had all those years. But Joe had been doing his homework and was especially tuned in to these animals. And he was also putting in the time it takes to learn. So off I went to spend two days off the coast of Rhode Island ... and low and behold ... 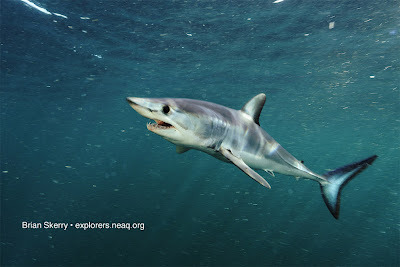 I saw three mako sharks. Incredible! The first one showed up on day one about 45-minutes after we stopped the boat. I was blown away! Two of the Makos stayed with us for a little while, one sticking around for several minutes. I got in the water and was able to have some wonderful close encounters. The shark was a small female and was stunningly beautiful. Her coloring was bold and vivid and she didn't appear to have a scratch on her. She moved with speed and with power, exuding the supremacy she clearly knew she had in the sea. I fired a few frames on my camera trying desperately to make sure exposure was correct and composition was good. Before my heart could stop racing, she was gone and I was climbing back on board the boat.